Time passes by too fast sometime, and certainly when you are on the adventure of your life in London. Today was my last day in London before flying back to the US, and then afterwards, Asia for the summer. Arriving last September in London, I honestly had no idea the once-in-a-lifetime adventures I would get to embark on. Samantha was the first girl I met in London—the type of girlfriend once you meet, you are comforted by because you are ecstatic to finally have a fabulous new friend to go on this adventure with! Therefore, it only seemed fitting to end London off by going on a last girl date with Samantha doing what we do best: brunchin’. Surprising me, Samantha picked The Riding House Café, a brunch spot that’s been on my list of to-try before I leave London. Walking into the café, the modern-style brasserie was a gorgeous place boasting an abundance of natural sunlight, lovely teal bar-chairs, old-style lamps, and decorative bookshelves. Although we sat in the back lounge where it was slightly more intimate than the front room, I would recommend the bar seats as a great option too—the color scheme had a nice Great Gatsby touch to it! Great tiled-bar with lovely teal leather chairs–really the perfect modern brasserie look! Another view of the bar: Samantha cannot wait to return for a solo brunch session here! 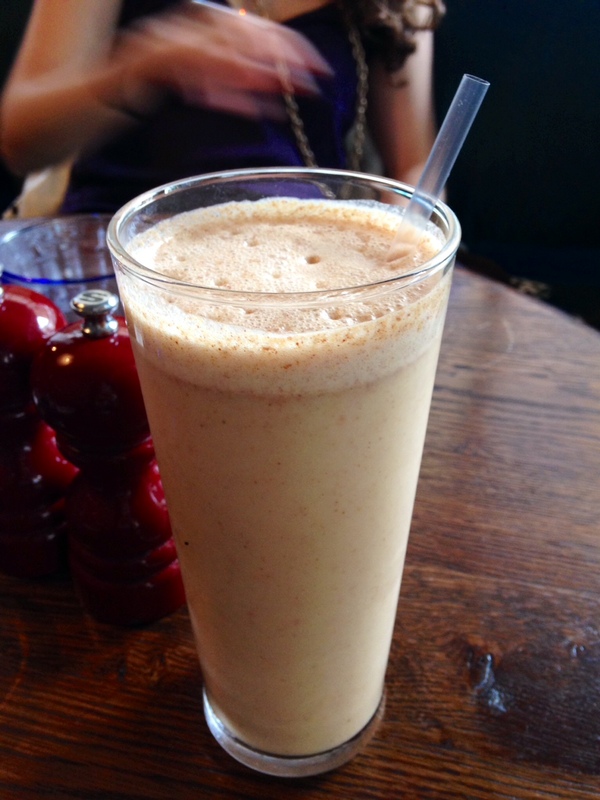 Wanting to be adventurous, I ordered one of Riding House Café’s famous juices, the PB & J. The base was fresh apple juice but with a wonderful dash of fruit and peanut butter later, it tasted like biting into a PB & J. So one word for it: awesome! Samantha, a true coffee enthusiast, also absolutely loved her cappuccino—a true stamp of approval for all caffeine-lovers. For our mains, we shared the Challah French Toast with berry compote, and Sweet Corn Hashbrown with poached egg, grilled mushrooms, spinach, and relish. The French toast had the crispy consistency of a well-done pancake, coupled with the berries and smothered in golden cream—it is the ultimate brunch comfort food. Unsurprisingly, the Sweetcorn Hashbrown was just as amazing. The sweetcorn gave the hashbrown a sweet touch and whatever relish they used was just phenomenal. 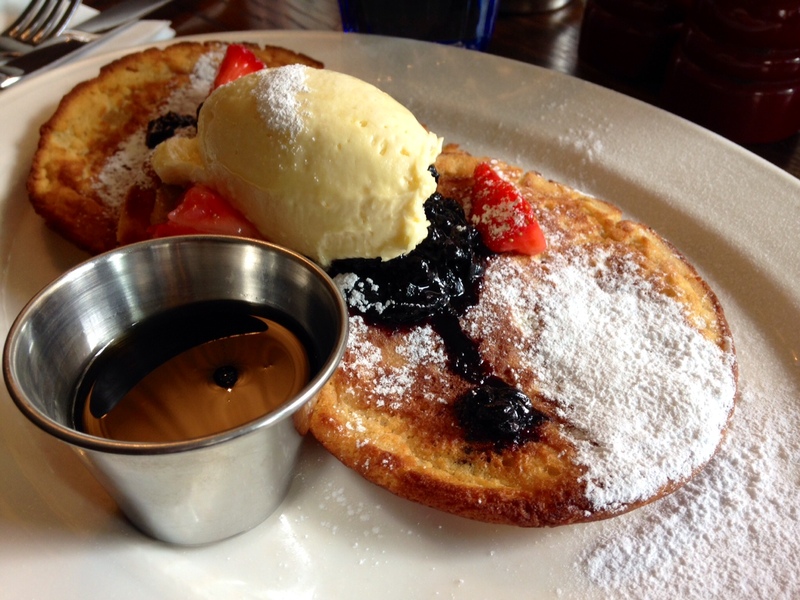 For a last brunch, Riding House Café was exceedingly delicious. Don’t miss out on this London find in Fitzrovia because the food was absolutely phenomenal and moreover, how great of a name is The Riding House Café? Until we meet next time London, thank you for your past year’s worth of hospitality! You have been a delicious ride of never ending adventures. From London with love, eatprayjade x. Seems you had a great year there, did any accent return home with you? look forward to following your eating and praying adventures, peace.